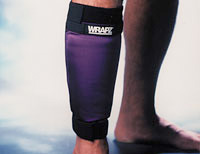 Each of the WRAPZ® products are designed to fit a major muscle or joint. The user inserts the chilled or heated WRAPZPAK® into the pouch. Follow instructions on the WRAPZPAK® to make the pack cold or hot. Wrap sleeve around the injured area and secure using Velcro fasteners. You are now free to continue your daily lifestyle activities while enjoying the therapeutic features of WRAPZ®. The Shin WRAPZ is a great way to treat and prevent injuries to the shin and calf areas. Many runners experience shin splints and this product works very well to apply therapy to this common occurrence. Placing the WRAPZ directly on the area where the discomfort occurs on the shin will ease the pain. If you have a calf injury, simply reverse the product centering the pouch of the WRAPZ on the calf for the same therapeutic effect. Height to 5 ft. 4 in. Weight up to 130 lbs. Height 5 ft. 2 in. to 5 ft. 11 in. Weight 130 to 185 lbs.